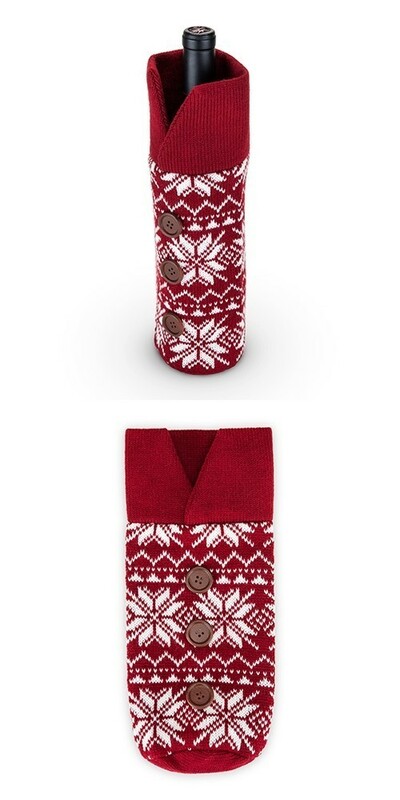 Dimensions: 14" x 5 3/8" x 1/4"
Keep your favorite vintage cozy in winter weather with this wonderful wine sweater knit from red and white wool itself, in a classic Nordic snowflake pattern, and finished with a trio of big wood buttons sewn in a perfect line down the front. Simply pop the cork and kick back for cozy fireside sipping. Holds one bottle and is perfect for gifting wine or displaying your favorite bottle. Makes a great gift or gift-wrap. PLEASE NOTE: Pictured wine bottle is not included.